There seem to be a lot of Mystery Pin sets being released lately. This, of course, makes you want to buy a few more sets to try an get the pin you want. 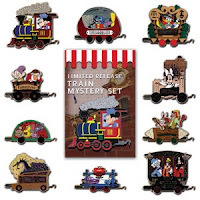 The Disneyland Resort Train Mystery Set. The set comes with two randomly selected pins, so you won't know which pins out of ten possibilities you will get. Each pin is a section of a train based on a section from Disneyland. There was a bigger twist this time, as there are two chaser pins. A "chaser" is an even more rare pin and is usually a surprise until someone finds it. 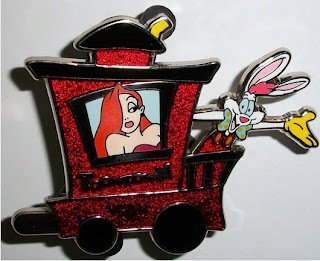 As you can see there are ten pins promoted, the chasers are not - one happens to be a pin of Toontown with Roger and Jessica Rabbit. The sets sell for $19.95 each and limited to 2500.